Dining outdoors doesn’t mean you have to compromise on style, price or design. Our chrome bistro table has a very modern chrome finish that’s weather resistant, as well as very chic looking. In fact, this is popular both indoors and outdoors with many of our customers, being chosen for internal and external areas in marquee events, receptions, bars, bistros, cafes and many more locations. Continental Ambiance That's Also Affordable! Although many of us associate bistro tables with restaurants and outdoor dining, they were actually first used in homes! Bistros are a kind of French dining establishment, that feature delicious homestyle meals in informal surroundings, but they’re believed to have evolved from kitchens that were set up in private housing, but open to the public - much like today’s residential pop-up restaurants. Opening up your own home in Paris to members of the public willing to pay for your food was a way landlords could earn more money from guests and other visitors. These kitchens probably served just tenants initially, but expanded to then welcome in passer-bys who wanted to visit for some tasty home cooked dinners. When homeowners food began to attract acclaim then householders would have felt more confident setting up proper businesses and opening premises as official restaurants and bistros. Even when homeowners were just serving tenants, they would have had to make sure they had all the furniture necessary to seat their guests. In order to accommodate more people, it makes sense that smaller tables and chairs were set up in homes, so there was room for those boarding and people passing by who wanted to tuck into the gastronomic delights served up by householders. As a result, bistro-type furniture became popular, and often featured smaller table and chairs that were also more lightweight so they could be easily rearranged in homes to suit different-sized groups of diners. Our chrome bistro table has all of these functional attributes - and more! The round shape is perfect for groups and is also small enough for lone diners and couples. 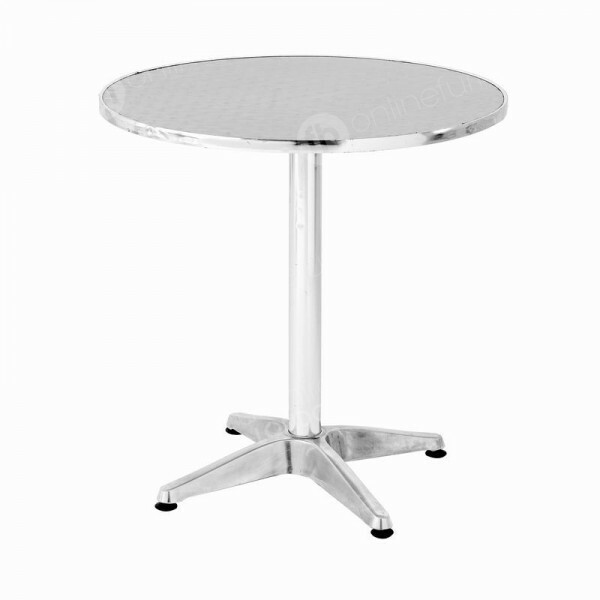 Being made from aluminium, our chrome bistro table is exceptionally lightweight, so it’s easy to move within venues. In addition to incorporating all these traditional aspects of some of the first kinds of bistro furniture ranges, our products also have some important modern day benefits. The chrome finish of our bistro tables are weather resistant, so you’re free to use them outside with confidence. Following bad weather, such as rainy spells, all that’s needed is a wipe with a dry cloth and they’re ready for use again. This is a great benefit when you’d like to make the most of the available space on your premises. Our entire chrome range gives you the tools to turn under-utilised areas into fully functional, modern looking dining areas. They’re a fantastic addition to outdoor events too, you’re able to use our chrome tables to create stylish reception areas. The appearance of our chrome bistro tables is another great benefit, and gives any London location an updated and contemporary look. The chic aluminium look is found on several of our furniture hire ranges so you can not only provide sophisticated poseur and bistro tables, but also seating, including our stools, like our high aluminium bar stool. Although the original bistro tables were used in outlets serving food, our range is very versatile and we not only deliver them to lots of different dining locations, but other premises too. They are popular choice for companies that want to set up stylish in-door break areas, giving colleagues somewhere to enjoy snacks, read magazines/newspapers or just chat with other workers while on their breaks. Our chrome range is also a top choice at corporate functions, such as networking events and conferences, or where you’d like to include zones in your events for breakout meetings or similar activities. Would these suit an indoor event? Yes. Although they’re made to be used outdoors they look equally stylish inside! in fact, lots of our clients like to use them for corporate events, and break area too, to provide chic tabling. 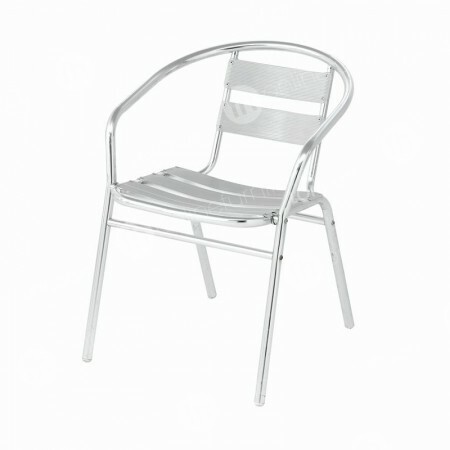 Are bistro chairs the only seating I can order with this product? You can combine any product you like from our range. For other outdoor seating to match our chrome bistro tables, you might like our white folding chairs, or indoors you can cover our tables and surround with any kind of seating for a glam look.